Springtime is near, and wedding season is blooming. After flights are booked and hotel rooms reserved, it’s time to pack for a once-in-a-lifetime vacation: your honeymoon. It’s easy to get caught in the hustle and bustle of the wedding and travel season. A little bit of additional organization goes a long way to save last minute panic attacks and disappointing mistakes. Plan ahead with these helpful travel and packing tips. Many common sense packing and prepping thoughts may fall out the window in the rush of planning a wedding. It’s really helpful to review and utilize all the basic traveling tips. Make a Packing Checklist: Starting two weeks to a month in advance, write out what you think you’ll need. This will give you plenty of time to edit and revise for an efficient suitcase. Pack a Light Suitcase: It’s easy to get lost in the moment of everything you’ll want to wear and have with you. But over-packing can be the biggest headache, especially in transit. Run through your suitcase the night before throwing out everything you won’t absolutely need, but keeping bathroom essentials especially if you’re travelling to a foreign destination. Pack for Varying Weather Conditions: Leading up to the take-off date, constantly scan the upcoming weather forecasts. It’s a good idea to keep an extra hoodie or pair of jeans even for a beach destination. Bring a Day Bag or Backpack: You’ve got your fashionable and efficient suitcase to lug all the clothes and hair products but consider the adventures you’ll go on. Having an easy-to-carry day bag will make it that much easier to go with the flow when you and your sweetie want to be spontaneous. Bring Important Items on the Plane: Think about your itinerary’s, documentation, hotel reservations, keys and any books, magazines, crossword puzzles, etc. for entertainment. Share Travel Info with Your Family: You’re an adult, and you can take care of yourself. But sometimes, weird things happen on extended trips. Give your parents copies of travel details. It’s always better to be safe than sorry. Ask Someone’s Who’s Been There: The perfect destination honeymoon may not be so perfect if you aren’t properly prepared. Be sure to read plenty of reviews about the place your visiting and ask friends about any unexpected elements. 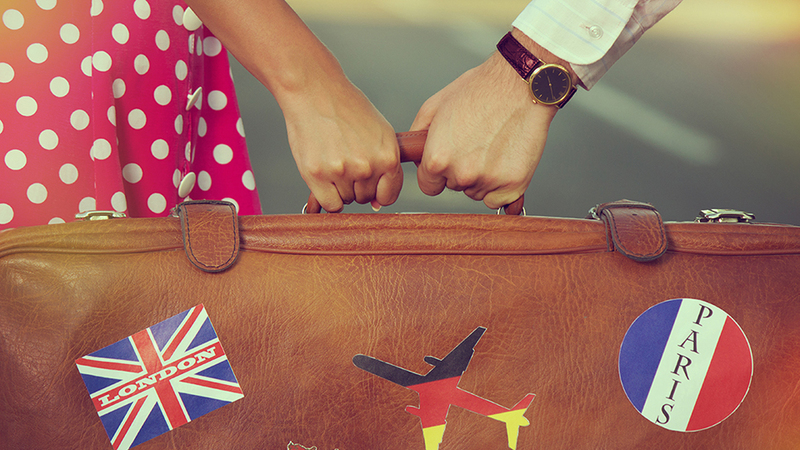 Wait Until the Last Minute: It’s a big job to sort out everything you’ll need for a honeymoon. Give yourself at least a week in advance to run through your packing checklist and sort out the suitcase. Bring Bulky Toiletries: Bring the necessities like toothbrush, toothpaste, deodorant and such. Definitely look for the travel-sized options when possible, even if you’re not flying. Bring Brand New Shoes: Those heels might be precious, but no one wants to be walking uncomfortable on their honeymoon breaking. Leave them at home. Forget Healthy Habits: It’s fun to splurge and you’re caught up in the celebratory spirit. But you’ll feel so much better if you remember to take small bites, eat your green vegetables and drink lots of water. Forget to Make Copies: Run through the scanner with all of your important documentation, passports, credit cards and itineraries. It never hurts to have that backup set stuffed away in your suitcase. Remember at the end of the day, it’s all about celebrating a new relationship. Plan ahead but don’t get bogged down in the details. Don’t forget to have fun and soak in every moment. But others are just procrastinators who don’t realize how stressed-out they’ll be if they don’t plan their honeymoon packing ahead of time.